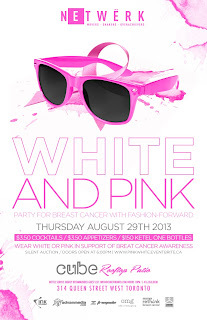 Join the C&C Girls next Thursday August 29th as they wear Pink & White to support Fashion-Forward.com 's Rethink Breast Cancer event at Cube Night Club. Who doesn't love a themed party in the summer on one of Toronto's hottest rooftop patios! Enjoy a night sipping cocktails and mingling with friends, supporters and survivors while supporting the silent auctions with proceeds going to support the cause. The first 30 guests to arrive will receive swag bags worth over $70. Be sure to dress in 'Pink & White' to show your support. Aside from supporting a great cause, everyone who claims a ticket on Eventbrite will also receive a pair of uber cool sunglasses (Pink or White of course)! You will also get access to one of the hottest summer patios in the city amongst a very Fashion-Forward crowd. Please Note: Only proceeds from advanced ticket sales will help support the cause, otherwise guests without a ticket will have to pay a $15 cover....so show your support! We're giving away 2 passes to 1 special blog viewer. To win 2 passes for you and a friend email us at chandeliersandchampagne@gmail.com with your full name, mailing address, and phone number with the subject line "Rethink Breast Cancer"